Toy manufacturers have become much more cautious about spoilers in recent years. Action figure lines tying into major Hollywood properties go into production quite early in the filmmaking process—probably in order to avoid a situation similar to the run on Star Wars toys during Christmas of 1977—but studios certainly don’t want spoilers leaking out either. (Sometimes things can go too far in the other direction: The Force Awakens line cautiously implied that girls are icky by sparsely including Rey in its first wave of figures, leading to rumors that John Boyega was the new Jedi.) However, in the internet age, even those that don’t subscribe to ToyFare are aware of all the latest action figure news. The public has already glimpsed the heroes of Paul Feig’s new Ghostbusters film, and at the 2016 New York Toy Fair, the new villains were revealed. According to Following The Nerd, amongst the villainous new toys are Mayhem, a sort of winged demon who is rumored to be “the Gozer” of the new film, and Rowan. 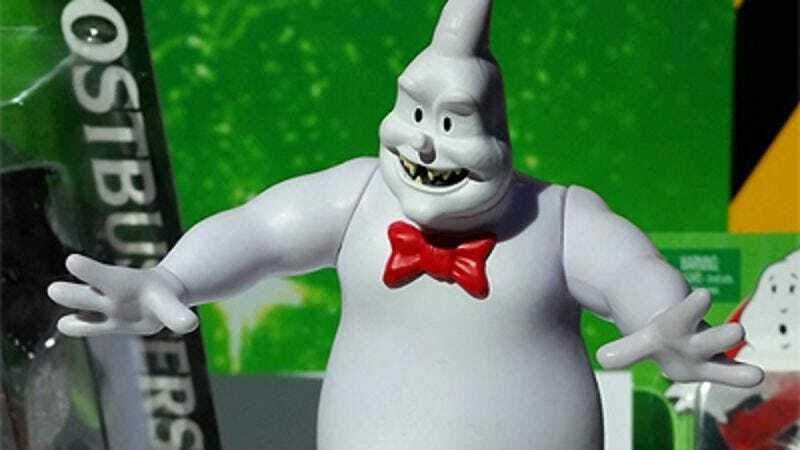 The Rowan toy is interesting, as it appears he is a manifestation of the “icon ghost” pictured in the Ghostbusters logo, designed by the late Michael C. Gross. If so, this potentially implies a shared universe between the new Ghostbusters and The Real Ghostbusters cartoon from the ’80s, where the icon ghost appeared in the opening credits and commercial bumpers informing the audience that the Ghostbusters would be right back after these messages. In other words, fanboys may finally get an answer to their schoolyard theorizing about what would happen if the Ghostbusters actually took on their own logo. The Ghostbusters are coming to save the world this July 15.